Bicycling is a lifestyle for me. It’s my transportation, recreation, vacation, and sometimes work. Though I always had a bike as a kid, I didn’t start to really get into cycling until I went on my first bicycle tour as a teenager. I was simply looking for a fun way to spend a summer, but I found my life-long passion. 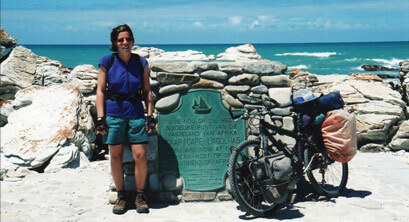 Since then, I’ve biked in all 50 U.S. states and on six continents, amassing over 100,000 lifetime bike miles. I’m now aiming to bike the entire perimeter of the United States. I’m a traveler at heart and have lived on three continents. After spending two years in the Peace Corps in the tiny African country of Lesotho, I wanted to explore more of Southern Africa. Doing so by bicycle, travelling at human speed and taking the time to really get to know the land and her peoples, was the natural choice for me. I started the trip with a riding partner but ended it alone, trusting my intuition and the kindness of strangers, and truly appreciating the rhythm of an unscheduled life on the road. 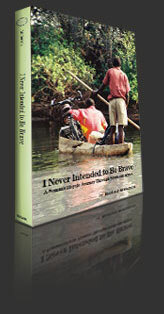 I Never Intended to Be Brave is my memoir of this seven-month journey bicycling through Malawi, Zambia, Botswana, Namibia, and South Africa.